We work with many small and medium businesses implementing and supporting Cloud Server IT environments, business critical data and systems. A Cloud Server environment is where our client utilises a virtual server/s hosted on a cloud platform like Microsoft Azure, (which is our recommended provider) instead of having their own server/s. Often a hybrid approach is also utilised using components On-Premise and on Cloud Infrastructure. No matter the exact configuration, much of the focus and challenges faced by small to medium businesses revolves around IT security. IT Security isn’t about being ‘un-hackable’, it’s about taking appropriate steps to reduce your risk and tip the odd’s in your favour. Just like you know that locking your car door at night isn’t going to stop someone from stealing it, businesses need to provide a layered approach to IT Security. A list of recommended basic steps for a business that is hosting it’s virtual servers on a cloud platform is listed below. Everyone knows what an Anti-Virus program is, but you should have a corporate grade, centrally managed Anti-Virus solution that is monitored to unsure it is updated frequently. New Virus foot prints are detected every day, and the only way these can be captured is by ensuring that your AV is updating reliably. A managed backup strategy that combines both an online backup to another cloud provider & also copied locally to another storage location on the same cloud provider. As a unified solution both the Online backup and local one stay synchronised with each other. This provides for fast restoration of files from a local source as well as the option to restore from the other cloud platform. It also allows easier monitoring of backup statuses which should occur 3 times a week. Complex Password Policies – The longer and more complex a password, the longer it takes for cyber criminals to work them out. Cyber criminals have automated software that scan the internet for commonly known ports (a front door to your system) and then start systematically trying password combinations. Complex passwords can increase the time it takes to work out a password from a few hours to hundreds of days. 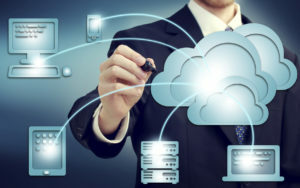 A VPN which stands for Virtual Private Network, is a technology used to add another layer of security when connecting your office to the cloud servers over the internet. It significantly increases security and reduces the chances of cyber criminals gaining access to your data. This is also used for staff who are connecting from home or while travelling. As mentioned above, when connecting your offices to the cloud servers, a VPN is used. Not all VPN technology is the same, and we recommend a certain type of VPN provided by specific routers. Monitoring and Maintenance steps are critical to ensure that your environment has the latest updates, security features and basic checks in place. Read our recommended IT Maintenance and Monitoring steps here.